Sen. Elizabeth Warren has released her joint tax returns with her husband. 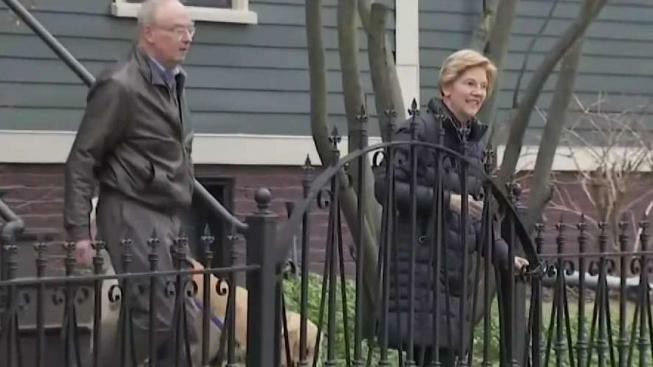 Democratic presidential candidate Elizabeth Warren has released her tax return for 2018, reporting that she and her husband paid more than $200,000 in taxes on a joint income of about $900,000 last year. The move by the senator from Massachusetts on Wednesday follows similar tax return disclosures from fellow presidential candidates Sen. Kirsten Gillibrand of New York and Sen. Amy Klobuchar of Minnesota. Their front-running rival for the party's 2020 nomination, Sen. Bernie Sanders of Vermont, has vowed to release his tax returns by Monday amid political pressure. Warren, who previously posted a decade's worth of tax returns online, has proposed legislation that mandates the public disclosure of tax returns for presidential and vice presidential candidates and for sitting White House occupants. "I've put out eleven years of my tax returns because no one should ever have to guess who their elected officials are working for," Warren said in a statement. "Doing this should be law." Among the other Democratic presidential candidates who have released past tax returns as they seek the party's nomination to take on President Donald Trump is Washington Gov. Jay Inslee. Trump broke with tradition in 2016 by not voluntarily releasing his tax returns. He routinely says he's under audit, but there is no rule prohibiting taxpayers under audit from releasing their tax returns. House Democrats are seeking Trump's tax returns as part of investigations into his business dealings and his Republican presidential campaign. One of Trump's lawyers claims the Internal Revenue Service can't legally release the information.